While most in the advertising industry know Edit1 as the leading pre-visualization studio, they may be unaware of the many creative labors-of-love going on under its roof after hours. 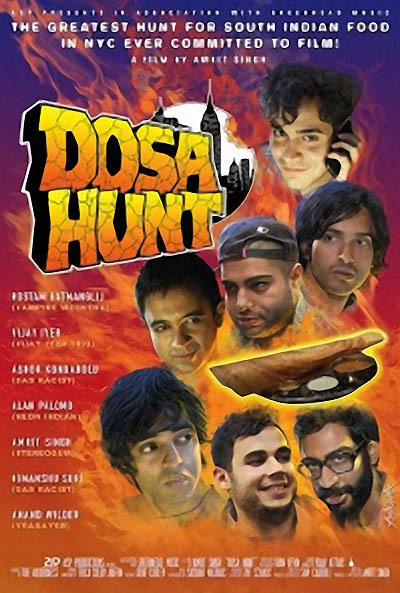 Case in point: “Dosa Hunt,” an acclaimed new independent documentary short Edited and Produced by Edit1‘s Zoe Schack, and featuring members of Vampire Weekend, Das Racist, Neon Indian, and Yeasayer. In the film, an all-star cast of NYC musicians join filmmaker/executive editor of online music website Stereogum Amrit Singh, to form a multicultural posse on a quest to find New York’s best South Indian crepe — the dosa. For Schack, it was a meaningful project that spoke to the cultural zeitgeist of the time, and an opportunity to reignite her passion for documentary filmmaking. The final result is an immersive, energetic and intimately amusing film that maintains a high production value despite its limited resources, thanks in part to Schack’s editing and to some creative solutions from the Edit1 team. Case in point: Late in the post-production stage, Singh (literally) dreamt up a new animated intro. Schack brought the concept to Edit1’s designer Erica Colby Jaffin and together they brought to life the witty animated sequence that strikes a perfect tone for the ensuing film, completed just in time for the film’s New York premiere. And while the film’s premiere and opening run has enjoyed an enthusiastic response from fans and critics alike, with positive reviews and profiles running in New York Magazine, Interview Magazine, BlackBook, Billboard, Gothamist, Elle India, and FADER, among others, for Edit1’s Owner and President Mike Zimbard, the biggest reward is watching Zoe’s creative growth, first-hand, thanks to her work on the film. For more information about DOSA HUNT, including future screenings and distribution news and to watch the trailer visit dosahunt.com, follow at @dosahuntand facebook.com/dosahunt, or join the mailing list.